ESSENTIAL QUESTION Who were the Aryans? Most Indo-Europeans were nomads. They lived in family groups or clans and herded cattle, sheep, and goats. They also were warriors who rode horse-driven chariots. They fought with long bows and arrows and with bronze axes. Around 2000 B.C., something drove the Indo-Europeans from their homeland. Historians do not know if a drought, a plague, or an invasion made them leave. Different groups moved to different regions. The Hittites went to Southwest Asia. Many other Indo-Europeans settled in parts of Europe. Hindu Kush - This mountain range runs along the northwest border of the Indian subcontinent. The Aryan people crossed these mountains to enter India. 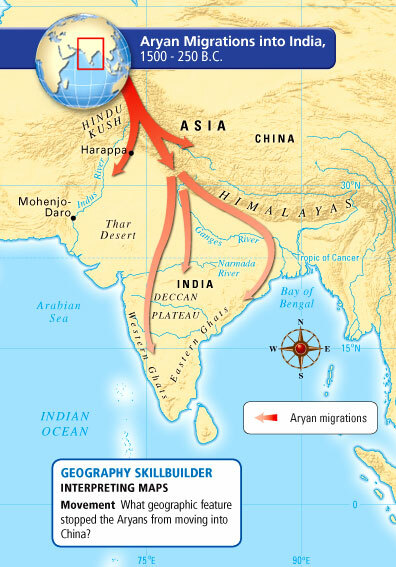 In about 1500 B.C., the Aryans (AIR•ee•uhnz) traveled east into India. According to some historians, the Aryans belonged to the larger Indo-European group. In contrast to the city-dwelling Harappans, the Aryans were herders. They lived in simple houses. They spoke an Indo-European language called Sanskrit. Did Aryan warriors in chariots conquer the walled cities and force the Harappans to flee south? For years, history books told that story. But new research suggests a different tale. Two hundred years before the Aryans arrived, the largest Harappan cities lay in ruins. As Lesson 1 explained, this destruction may have been the result of earthquakes and floods. ESSENTIAL QUESTION How was Aryan society organized? The Aryans entered India gradually. They practiced a mysterious religion that appealed to many Dravidians–the people living in India when they arrived. As a result, Aryan religion and language spread. In turn, the Dravidians taught the Aryans about city life. Because of these interactions, India developed a complex, blended culture. After many centuries, another group came into being thatwas considered below all other groups. This group was called the untouchables. They had to do the jobs no one else wanted. Untouchables were considered outside the system and below it. They did jobs no one else wanted, such as being sweepers and disposers of dead bodies. The early religion of the Aryans is now called Brahmanism, after the name of the Aryan priests, or Brahmins. The Aryans worshiped many nature deities. The Brahmins made sacrifices to those deities by offering animals to a sacred fire. Over time, the ceremonies became more and more complex. Some lasted for days–or even months. The rituals of the Aryan religion and many hymns to their deities are found in ancient Sanskrit sacred texts called the Vedas. As time passed, Indians began to question how the world came into being. These questions led to changes in contemporary religious ideas. One change was a belief that one spirit governed the universe. Later, Indians wrote about their ancient history in such works as the Mahabharata (MAH•huh•BAH•ruh•tuh)–an epic poem that retells many legends. The Bhagavad Gita (BAH•guh•vahd GEE•tuh) is part of the Mahabharata. ESSENTIAL QUESTION How did the religion of Hinduism develop? The Bhagavad Gita is an important sacred text of Hinduism. Hinduism is the modern name for the major religion of India, which grew out of early Brahmanism. Background: The Bhagavad Gita tells about a warrior, Prince Arjuna. A great war is about to begin. When he looks at the enemy army, Arjuna sees many friends and relatives. He does not want to fight. With Arjuna is his chariot driver, Krishna. In reality, Krishna (shown at right) is the deity Vishnu in human form. In this excerpt, Krishna tells Arjuna that he must do his duty. Do not hesitate in your sacred duty as a warrior. fight for a just cause. . . .
honor will be lost. . . .
you will enjoy the earth. Fight for the sake of fighting. In this way you will not incur sin. Hindus worship many deities. Although they believe in many deities, Hindus also recognize one supreme God or life force. Hindus consider the other deities to be parts of the one universal God. 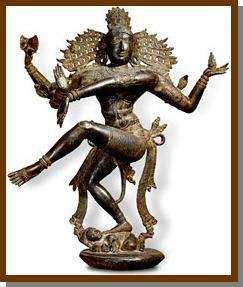 The three most important of the other deities are Brahma, the creator; Vishnu, the protector; and Shiva, the destroyer. (Shiva destroys the world so that it can be created anew.) Shiva's wife, Kali, also has many worshipers. Reincarnation creates a repeating cycle of birth, life, death, and rebirth. The cycle ends only when a person achieves a mystical union with God. To achieve that, a person must come to realize that his or her soul and God's soul are one. Hindus believe they connect with God by following their own individual path. Part of that path concerns one's job, which is linked to the caste system. Devout Hindus must faithfully carry out their assigned duties in life. Hindus have a choice of spiritual practices to grow closer to God.Two of these are also popular in Western countries. Meditation is the practice of making the mind calm. Yoga is a complex practice that includes exercise, breathing techniques, and diet. • After Harappan civilization declined, Aryan people brought their culture to India. • Aryan society developed a class structure that was based on jobs and is called the caste system. • Hindus worship many deities. They believe in reincarnation and karma. Hinduism ranks third among world religions in the number of followers (after Christianity and Islam).